Overview (No Spoilers): Without exaggeration, Red Rising, while being comparable to the first books in the Hunger Games, Divergent, and Maze Runner series, manages to outshine all of them. Well, perhaps I’ll backtrack slightly and place Pierce Brown’s novel on par with Maze Runner, which will always hold a soft spot. Brown, using brilliant, insightful imagery, details a futuristic world broken into many, very distinct castes. The lowest of the classes, Red, is genetically designed for difficult, manual labor, specifically for colonizing/mining Mars for crucial fuel and metals. The complacency of a young, talented lowRed, Darrow is tested when tragedy strikes his content, sheltered community. Brown successfully weaves a story filled with clever twists and an underlying humor that literally made me laugh out loud, much to the confusion of my husband. 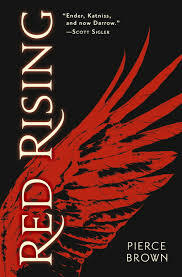 Overall, read Red Rising immediately before everyone and their brother jumps on the bandwagon! Soon all of your coworkers will be chatting about Darrow and his dangerous quest. Why did the Sons of Ares choose a Red as the caste from which they carve a Gold from? Other classes such as Obsidian would have the needed strength, while Yellow would specifically add intelligence, or maybe a Green to be able to manipulate technology. It also seems like an individual from lowRed would have an overarching disadvantage due to an unavoidable ignorance of Mar’s surface life. I found Darrow, during the games, to have similar insights, leadership mistakes, and revelations as Ender Wiggin. Appropriately, there is a reference to Wiggin during a conversation between Darrow and his Proctor. I’d suspected that the Sons of Ares would not put all of their eggs in one basket with Darrow, and that he would find another Red during the progression of the game, however I did not see that large, intimidating, and violent Titus being a chosen Red. His rage and insistence toward vengeance would potentially ruin the mission at hand. I am curious as to his history/story? Was Dancer behind his Carving or another arm of the Sons of Ares? Similar to Hunger Games, Red Rising, forces children to commit heinous acts to survive. A critical difference between the two involves the participants in the first example are fighting for their lives, while those of the later, are not necessarily facing death with the main goal of cultivating skills which will allow them to rise within their society. Sevro must know that Darrow is a Red, or at least hiding something. How will this loose end come into play during the sequel? I felt relieved and surprised that Mustang did not betray Darrow. Her character, in general, was refreshing as a strong, female character, which exhibited, heightened perception and intelligence during various difficult situations. As much as I enjoyed Mustang’s personality, I found myself increasingly disappointed, and frustrated with Cassius’ character as the story progressed. He was so blinded by family honor and perceived insults that he lost his grasp on the ‘bigger picture,’ which entails succeeding at the game in order to further his family interests, especially with the loss of his brother. Cassius, seemed to lose sight of the fact that all of the Golds were forced in the Culling to kill or be killed, therefore not one of the Golds’ hands left the ruthless Institute innocent. Will Darrow accept that all Golds do not agree with individuals such as the ArchGovonor and the ironGold’s traditional views? Mustang and Cassius’ Mother independently expressed very progressive views explicitly noting the worth of the lower castes. Perhaps the Gold culture doesn’t need destroyed but reassessed and updated? Why did Darrow agree to join the ArchGovernor’s ranks? He could have easily rose through the Gold society with Cassius’ father or Lorn au Arcos? The ArchGovernor’s personal and professional problems, caused by Darrow, might hinder Darrow’s ability to rise far enough within the Golds to help his people. I also read this book and wrote a review earlier this year. This reader liked Red Rising much more than I did. It is so interesting to see how a book that one reader loves is not a all that good of a fit for another reader. There are so many well written books out there but it is very personal whether they touch us. I keep looking for the audiobook versions for my husband to listen to and can’t find them either at my library! Words can’t describe how much I love this series! I hope the movie does the series justice! Good luck looking for it!